eXtreme Dog Fence® has created an in-ground fencing system with state-of-the-art electronics. The TempCheck and WireCheck ensure your system performs optimally regardless of external conditions while the frequency selection let's you change frequencies to avoid interference from neighboring fences and electronics. Despite the high-tech electronics, the collar is the highlight of the system. Weighing in at just 1.1 ounce, the collar is lightweight and small. Its also excellently waterproofed so if you have a lake or pond this is a great system for you. Although the dog fence collar uses a PTPRB-003 battery which is not rechargeable, the battery has a nice long life to make up for it. The unique rubber Comfort Contact probes are more comfortable for your dog. eXtreme Dog Fences are made in the U.S.A. One of the only dog fence systems still made in America, this is a major plus for us and we find the general customer service and quality control of these systems is much better than the foreign made systems. Digital Frequency Encoding: The digital frequency encoding is a handy feature if you think a neighbor may also have an electric dog fence. This tech feature eliminates stray signal interference from neighboring dog fence systems and other signal generating devices. Nearby dog fence systems and other devices that generate similar signals can interfere with your electric dog fence causing signal interruption or unreliability. Small & Lightweight: The eXtreme Dog Fence® Active receiver collar is one of the lightest and smallest collars in the industry (surpassed only by the small dog specific PetSafe Elite Little Dog). 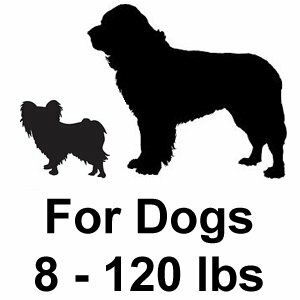 Weighing in at only 1.1 ounces it is suitable for dogs right down to 8 lbs. For dogs smaller than that you'll want to go for the PetSafe Elite Little Dog, which tones down the correction strength in addition to the small collar size. Comfort Contacts: The eXtreme Dog Fence® Active receiver collar uses unique conductive rubber contact points to increase collar comfort for your dog. While the comfort contact points conduct the correction just like metal contact points, they are softer and less irritating on your dog's skin. The comfort contact points make this system the number one choice for dog's with sensitive skin. 8 Individual Correction Settings: The small eXtreme Dog Fence® Active collars are capable of 1 tone only setting, 5 unique static correction level settings and 2 progressive settings that automatically increase as the dog continues towards the boundary line. Each collar on the system has its own correction level setting, but rather than being set on the collar itself, they are set at the transmitter. The unique correction level settings and lightweight collar make this a good choice for multi-dog households where all dogs are 8+ lbs. Battery Check: The patented Battery Check feature ensures you only change the battery when it is truly depleted. The Battery Check feature auto-activates every two hours to ensure you know as soon as your battery is low. Since battery output fluctuates depending on the environment and other factors the eXtreme Dog Fence® collar requires 3 consecutive low battery triggers to set off the low battery indication. Exceptional Waterproofing: Because the Active collar does not have any buttons or dials on the collar itself, the waterproofing is really perfect. The collar can be fully submersed while functioning. Because of this feature we recommend the eXtreme Dog Fence® for rainy climates as well as lake front installation or yards with ponds or pools. Disposable Proprietary Battery: This collar uses a disposable proprietary battery. Most people prefer a rechargeable battery, a generic battery is second best because it's easy to get your hands on. The proprietary battery is generally our least favorite but does have it's virtues in this case. The Perimeter Technologies proprietary battery has a pretty impressive 2-4 month lifespan and their superior tech features include a sophisticated battery indicator that detects a true low battery so you only change it when it is depleted. For some people a battery change every 2-4 months is preferable over remembering to recharge daily. Multiple Frequencies: The standout feature on the eXtreme Dog Fence® transmitter is the multiple frequency selection. This feature ensures that your dog fence will work, uninterrupted, even if your neighbors install their own dog fence or there are other signal emitting devices around. Adjustable Boundary Zone: The boundary zone width adjustment on the eXtreme Dog Fence® system is completely digital so you can make really precise adjustments. The zone width can range from just a few inches to 32 ft. and the system is capable of remembering and returning to past settings. Temp Check & Wire Check: eXtreme Dog Fence® is known for their attention to detail and techie system components. 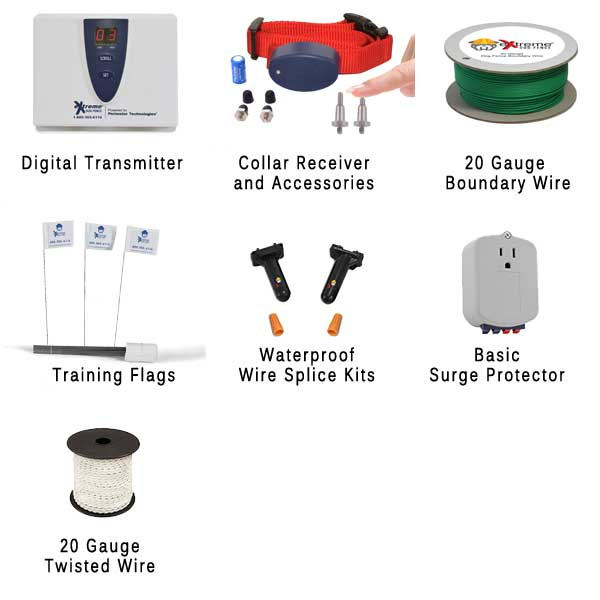 Their patented Temp Check and Wire Check diagnostic features automatically sense and adjust for temperature and electrical changes that could impact the performance of the dog fence boundary wire. This may seem unimportant in average climates but can actually make a significant difference in very cold temperatures or areas where the power is spotty at times. 25 Acre Capacity: The eXtreme Dog Fence® PRO-Grade dog fence is capable of installations of 25 acres or less. While other fences in the same price point offer greater coverage, 25 acres is more than enough for most urban and suburban properties. Lacks Battery Backup: Surprisingly, despite all the tech savviness at eXtreme Dog Fence®, this system lacks battery backup in case of power failure. While the transmitter is very reliable, if the power goes out and the boundary goes down, your dogs will be unprotected. • Perimeter 6-Volt Battery (PTPRB-003) -The average life of this battery is 2-4 months. I could not believe how inexpensive it was to purchase this system. I needed containment for my pooch and I am renting a house. My choices are to continue walking my dog on a leash, build a new fence or install an electric dog fence. For $199 my dog is contained. The wire made this an inexpensive and effective fix for a big problem. If you have a lack of money and need a way to safely contain your pet for any reason as did I, don’t hesitate to look into what Flex Pets.com can do for you. They have been more than I ever dreamt and can hopefully be that same blessing for you. Wonderful job guys!" Overall The product was good I have been using it for some time now and I have to say it’s great for people who are in a good place, meaning stationary I move about much to often to be hassled with the set up process . Other than that Is is a well crafted product and does deliver. My personal tastes are more suited to the wireless system, as I am always about back and forth from U.S to London. It is wonderful having the chance to know that you pet is safe!. thanks guys. This is a marvelous product. I did not want to outlay vast amount of money for a fence to prevent my pet Doberman from escaping the backyard. A relative of mine suggested I try Perimeter Technologies Deluxe Ultra. I was pleasantly surprised as the kit was incredibly easy to install and simple to use. I have been using the technology for several months and have not encountered a single problem. I would recommend this particular product to anyone who wants to keep their pet safe. The only one minor complaint I had was the wire was a bit cheaper in retrospect I wish I would have upgraded to the Ultimate system, the ad said that system had much heavier duty wire.